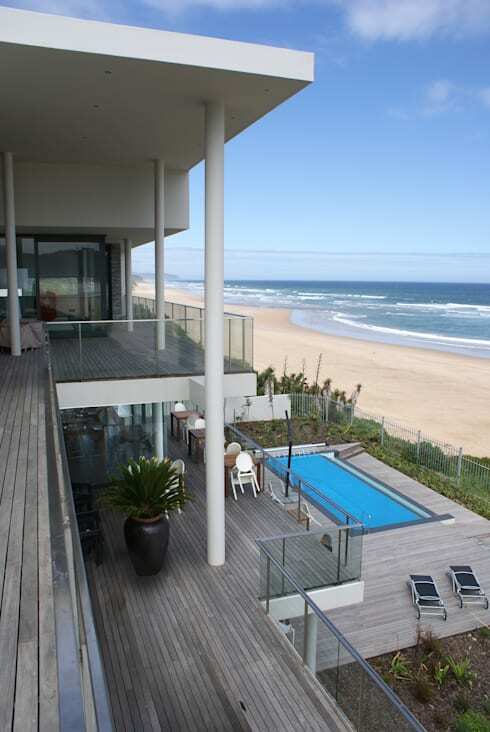 Today on homify 360°, we retreat to the Eastern Cape for a little sand between our toes, the wind through our hair, and one stunning villa as location. 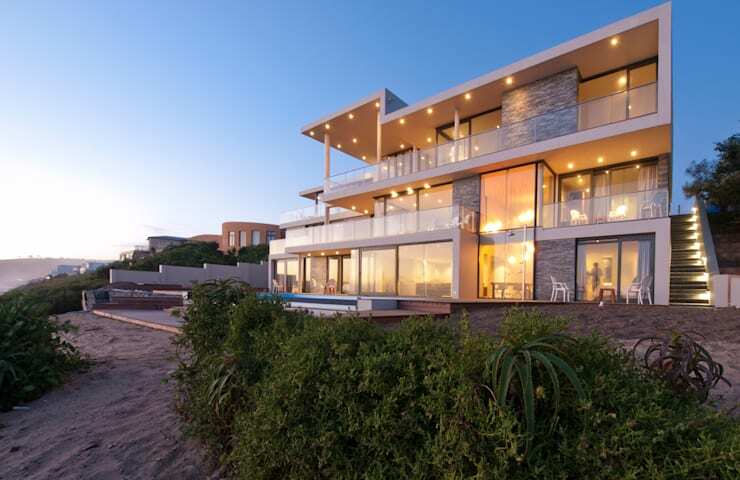 Here is where Dutch firm Van Ringen Architects created a luxury guest house, known as The Ocean View, which proudly fills 796sqm while revelling in its glorious beach setting. 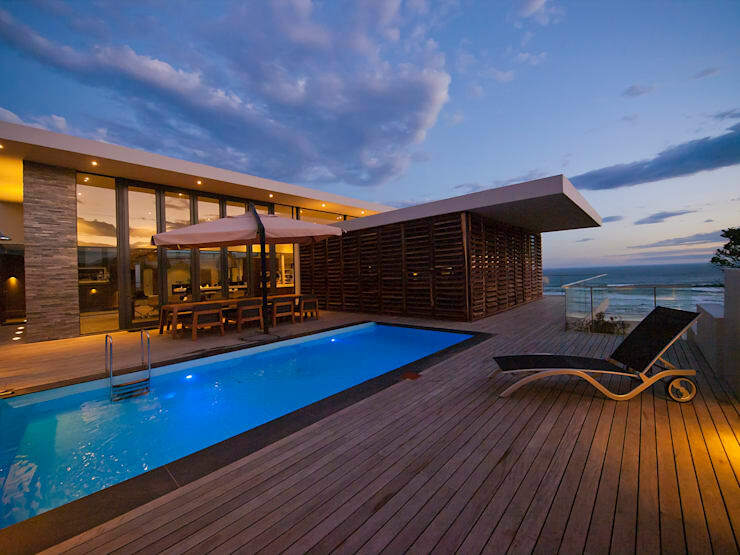 Located on a steep slope overlooking the majestic Indian Ocean, the guest house boasts impressive terraces to soak up as much South African sun as possible. Thanks to a southern facade that is predominantly transparent, beach- and ocean views come flooding into each room for optimum effect. Let’s take a closer look at this deluxe four-star accommodation paradise that offers a chic layout, signature decor, and all the comforts of a private home. We gaze up at the guest house’s south side, with the grand ocean behind us. Its imposing structure presents three levels, all decked out with large windows. What a delightful contrast between the transparent glass and interjecting pieces of stone finishing. Although quite prominent, the villa’s layout is clear and straightforward to comply with the requirements of the modern architectural style. No unnecessary frills to distract from the prime structure. And there’s no need for neighbours at the back to complain; due to the sloping landscape, all structures here get a glimpse of that splendid ocean view. For those who pride themselves on soaking up the sun in style, several terraces are available. And what’s more stylish than having a swim while enjoying an ocean view? 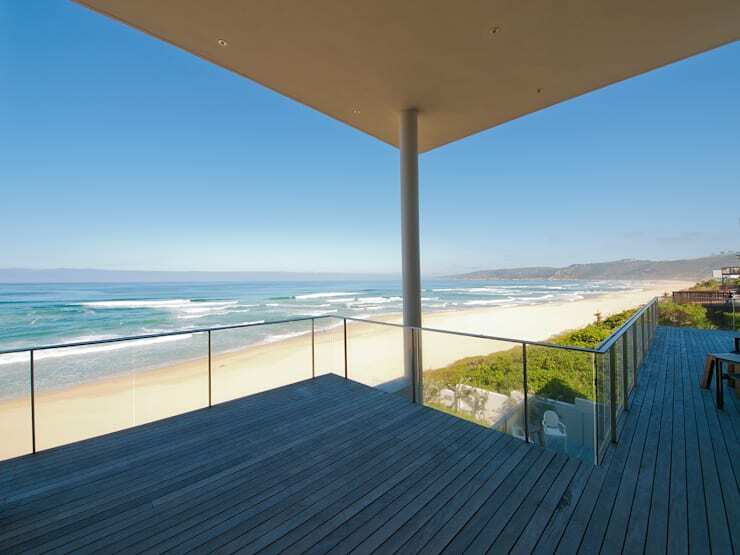 Modern glass balustrades ensure an uninterrupted view while lounging on that stunning wooden deck. And a wooden dining set in the corner stands ready and waiting for some al fresco feasting next to the pool. So, whether we’re seeking some r&r with a good book, or a lively conversation with friends and cocktails, it would seem we have found a prime location to serve our needs! From a luxurious exterior to modern interior layouts and decor. 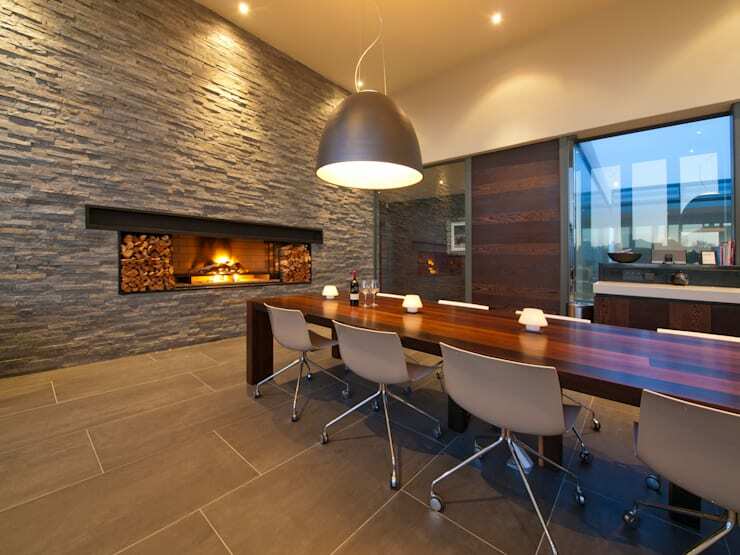 The dining room is certainly dressed to impress, with a cool stone wall adding a rustic touch to the modern style. Quiet and simple elegance seems to be the theme here, as all the chosen materials are subtle and natural, with soft palettes (beige, cream, warm wood) running the show. A metal symmetrical light fixture ensures an illuminated meal/conversation at this table, while soft whispers of downlighters are perfect for a more quiet, intimate meal. And who can overlook that open fireplace – pure perfection for those winter evenings, along with a glass of red wine and the roaring ocean waves, of course! In-between this luxurious structure with its glass, wood and concrete we find a spot of lush paradise in the courtyard, which serves as a link between the various levels and rooms. An open-air area, the garden receives its required sunshine and rain, and adds to the visual elements that can be enjoyed from all rooms. It is no mistake that so many glass surfaces have been used – transparency plays a very important role in this design. The large windows invite a gorgeous amount of natural light into the rooms. 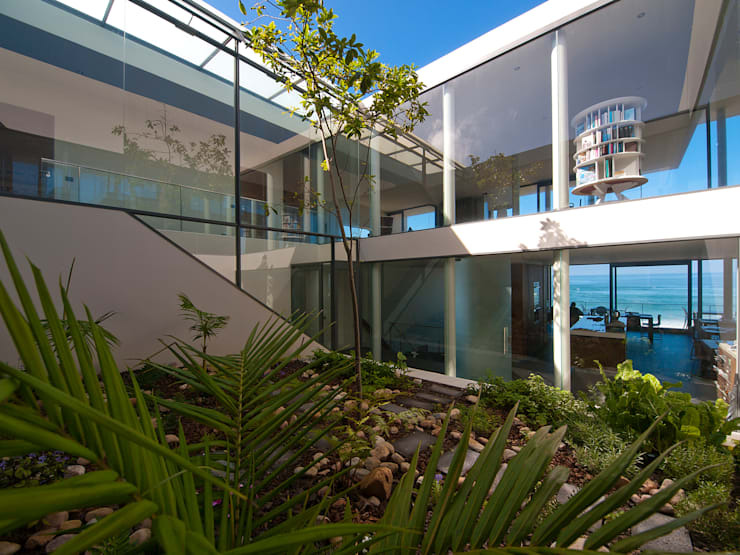 They also allows for uninterrupted views of the ocean, beach, and the green garden, creating a strapping link between guest and nature, and also ensuring a calm and fresh atmosphere throughout the house. Whether implemented to enhance an outdoor area or to simply add style, outdoor wooden blinds are certainly a unique element. Here, the coffee-brown blinds fit in stunningly with the sandy hues of the deck, and does absolutely nothing to distract from that beach view – on the contrary! 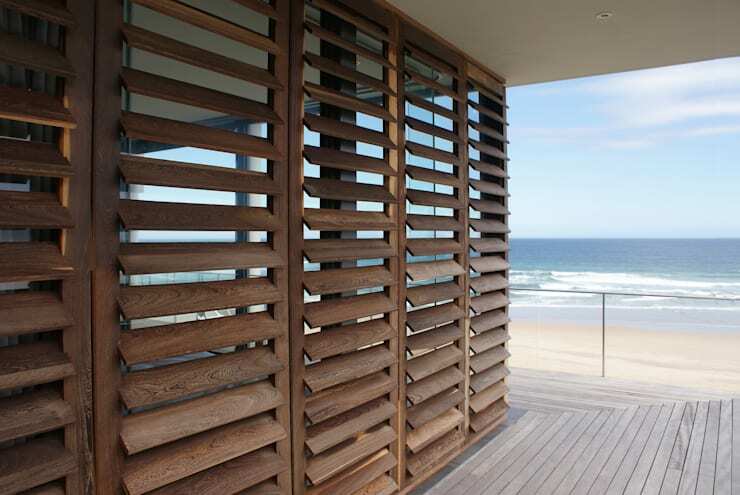 Truly a fantastic approach to protecting the interior from sun and unwanted glances, and to defend the windows from that frantic ocean wind. Having trouble deciding on window treatment? Feed your creativity with these: Functional And Stylish Curtains And Blinds. One elevated side view to take in as much of the terraces as possible. The layout of the different decks (and three floors) ensures that nobody is picky about which spacious patio they end up on – any one will do for some sunshine (or shade) and to experience that ocean view. A clear linear design stands out among the chic elements, and whether it takes on the form of wood, concrete or glass, it still manages to impress with a firm splendour. homify aims to offer you an extensive selection of creative inspirations in the realm of architectural exterior and interior. Take a look at some fantastic ideas when it comes to a balcony, porch and terrace. And now to get a glimpse of that ocean view. Pick a terrace here, any terrace, and you’ll be treated to a sensational and undisturbed sight of the majestic blueness of both sea and sky. White waves frolic on the horizon for your viewing pleasure, while the sun-kissed beach invites you for a stroll session filled with shell searching. Here is where you can take in nature at her serene best, either while lounging in the shade, or enjoying an outdoor meal. Forget the wine, this is a view reserved for champagne!